Looking at the past year, 2017 has been friendly to passive indexing strategies. The S&P 500 reached new all-time highs; high yield bond indices showed strong returns; risk appetite as measured by the BofA Merrill Lynch US High Yield Option-Adjusted Spread remained robust; and a trend of steady U.S. economic growth continued. Investors responded with enthusiasm for the general market rise, as the top 10 recipients of net fund inflows went to passive strategies, per Factset. As we discussed in a recent update, a tactical trend-following model has in recent decades carried an expectation of a number of false risk-on and risk-off signals, which chip away at returns. Tactical Income experienced one such false risk-off signal in early November. Trend-following would require less patience if the periods of underperformance were immediately followed by periods of outperformance in a neat alternating pattern. In this note we examine a 200-day moving average trend-following strategy in high yield, from January 1990 onward. During that period, trend-following strategies have had a number of losing streaks as defined by three or more false signals within one year. What is a false signal? In this analysis, it is negative return to a risk-on signal to invest in high yield bonds, or it is a relative return of the ICE BofAML 3-5 Year US Treasury Index minus the return to the High Yield index if we had instead remained invested. The return evaluation period ends upon the realization of the next signal. The idea is to count bad relative outcomes, or instances where our result was worse than had we just left things alone. In a normal risk-off signal, we choose the Treasury index. We find it has a very compelling risk to reward profile in a distressed market environment. If selling high yield and buying Treasury bonds results in a positive 1% return from the treasuries, and a missed positive 0.9% return in high yield, we would not consider this a false signal, even though we missed a positive return from high yield bonds – we would have still been better off in Treasuries. We must also remind: Counterpoint’s Tactical Income strategy does not use the 200-day moving average. We use it here to illustrate how trend-following systems work. Roughly two-thirds of all losses came during losing streaks during the period we reviewed. It is worth noting that Counterpoint attempts to mitigate the risk of false signals inherent in moving average-based investment systems through other quantitative methods, as we seek to reduce the total trade count. In any event, successful signals have more than made up for the losses from bad streaks. 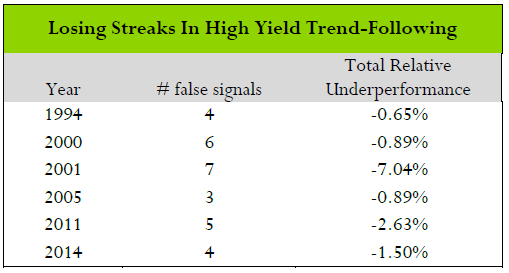 Although there have been relatively few winning streaks, the benefits to accurate trend-following signals have more than made up for the cost of being wrong. The following chart illustrates this observation. Trend-following signals that result in small gains and losses are occasionally interrupted by signals that are notably more profitable. 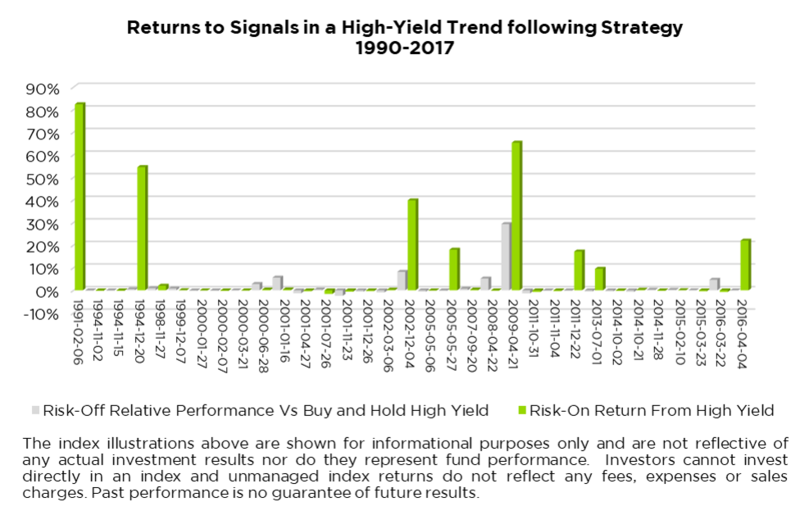 This example illustrates that a trend-following strategy in high yield will entail periods of mild positive and negative performance that risks underperformance versus a passive strategy. However, those lulls and losing streaks give way to occasional tactical allocations that deliver substantial returns – especially in risk-off situations (look to larger grey bars where treasuries greatly outperform high yield bonds while invested in treasuries). This observation is consistent with our three-year track record, which contributed to our five-star Morningstar ranking. Amid enthusiasm for passive strategies and expensive fundamental valuations across asset classes, we remain attentive to our primary focus – the management of downside risk. Although we do not attempt to predict market cycles based on macroeconomic analysis, we are confident that our quantitative trend-following strategy will continue to serve investors well as we head into 2018. Please see the linked page for the latest performance results of the Counterpoint Tactical Equity Fund, or this link to learn more about the Counterpoint Long-Short Equity Fund. Recent factor performance shown from the below factor styles draws similarity to factor exposures within our equity funds. A summary of Asian developed market and US Russell 2000 returns from several individual factor styles, some of which Tactical Equity and Long-Short Equity use in its stock selection process, are provided here by S&P Capital IQ. Categories for which positive performance is good are highlighted in green. Investors who buy the most volatile stocks typically underperform in the long-run, so this factor is highlighted in red. In contrast, performance has been positive on the domestic side of our market-neutral portfolio, offsetting much of the negative return coming from Asia. Solid valuation, earnings quality, and capital efficiency factor performance have recently helped offset international challenges. Taken together, fourth quarter factor returns were weak drivers of portfolio performance as exposure to the S&P 500 explained the large proportion of returns. Return Spread is the difference between the top quintile and bottom quintile returns, seeking to eliminate the broad market return to show performance on a factor. Size is a blend of returns to market capitalization and total revenues. Top quintile represents highest market capitalization and revenues. Volatility is blend of factors to total standard deviation in annual and recent month periods as well as beta to the broad market. Top quintile represents highest volatility stocks. Analyst Expectations represents factors such as realized earnings surprise versus expectations measures, and estimate diffusion (the net change in analyst expectations of earnings results). Top quintile represents the blend of signals that signify positive developments for companies relative to baseline expectation. Historical Growth represents a blend of factors including 1 year changes in cash flow and earnings per share. Top quintile represents those companies which have historically exhibited the highest growth rates. Price Momentum is a combination of momentum factors (i.e. recent 12 month return, five day returns, nine month returns). Top quintile represents stocks that have had the best recent price performance. Earnings Quality represents measures that describe the quality of earnings including net profit margin and stability of net income. Top quintile represents stocks which excel in these measures. Capital Efficiency refers to a firm’s ability to deliver excess returns relative to its cost of capital. It includes a blend of ratios such as return on equity, return on invested capital, and share issuance. Top quintile signifies companies that excel in these measures relative to the rest of the market. Valuation factors are variety of metrics some as book to market, earnings to price, sales to price, and cash flow to price. Top quintile represents stocks which excel in these measures. The BofA Merrill Lynch Option-Adjusted Spreads (OASs) are the calculated spreads between a computed OAS index of all bonds in a given rating category and a spot Treasury curve. An OAS index is constructed using each constituent bond’s OAS, weighted by market capitalization. The BofA Merrill Lynch High Yield Master II OAS uses an index of bonds that are below investment grade (those rated BB or below). The referenced indices are shown for general market comparisons and are not meant to represent the Fund. Investors cannot directly invest in an index; unmanaged index returns do not reflect any fees, expenses or sales charges. ICE BofAML 3-5 Year US Treasury Index is a subset of ICE BofAML US Treasury Index including all securities with a remaining term to final maturity greater than or equal to 3 years and less than 5 years. The BofA Merrill Lynch High Yield Bond Master II® Index is an unmanaged index that tracks the performance of below investment grade U.S. denominated corporate bonds publicly issued in the U.S. domestic market. The index results above are shown for informational purposes only and are not reflective of any investment. As it is not possible to invest in the index and unmanaged index returns do not reflect any fees, expenses or sales charges. Past performance is no guarantee of future results.